Taiwan based EVA Airways Corporation operates passenger and dedicated cargo services to over 40 international destinations in Asia, Australia, Europe and North America. It is the second largest Taiwanese airline. In October 2005, EVA Air launched a campaign with Japanese company Sanrio to create the "Hello Kitty Jet," featuring the popular Japanese character. 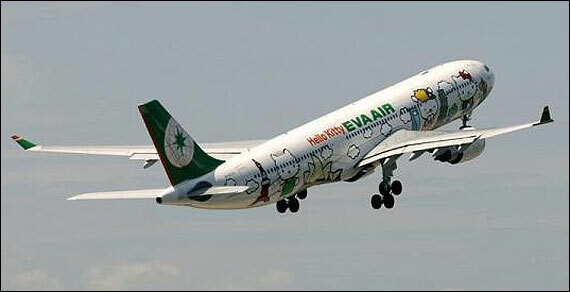 The original Hello Kitty livery was retired in 2009, but in 2011 EVA Air announced its return in redesigned form to mark the carrier's 20th anniversary and renew interest in Japanese tourism. 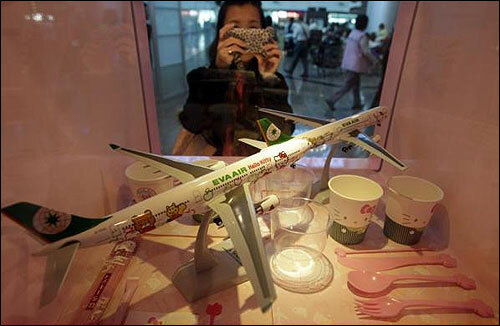 For this occasion, EVA Air had ordered brand-new Airbus A330-300s to be painted in an all-new Hello Kitty livery. Image: Eva Airways aircraft painted with Hello Kitty characters takes off at Narita international airport in Narita, east of Tokyo. 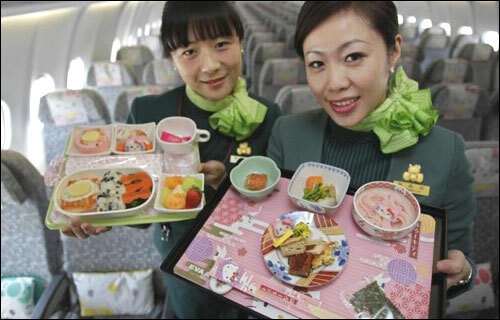 Flight attendants, holding Hello Kitty-themed in-flight meals, pose inside an Eva Airlines aircraft in Taoyuan International Airport, northern Taiwan. 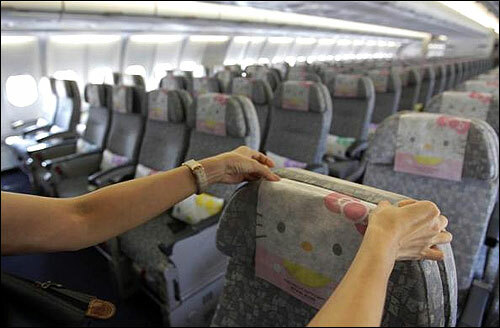 A flight attendant arranges a Hello Kitty headrest cover inside an Eva Airlines aircraft. 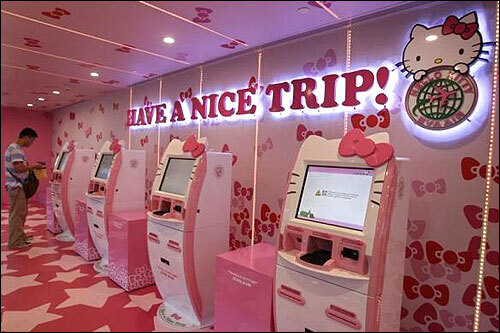 A passenger stands next to Eva Airlines' self check-in counters, which are decorated with Hello Kitty motifs. A passenger takes pictures of Eva Airlines' Hello Kitty-themed products displayed in Taoyuan International Airport, northern Taiwan. 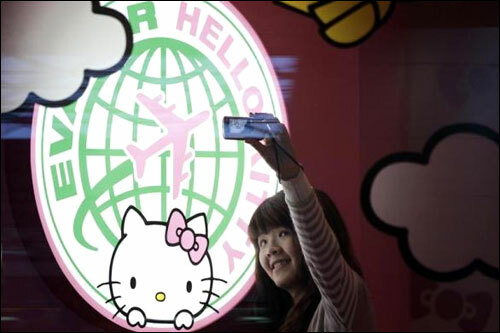 A passenger takes a self-portrait with an Eva Airlines' Hello Kitty-themed light box. 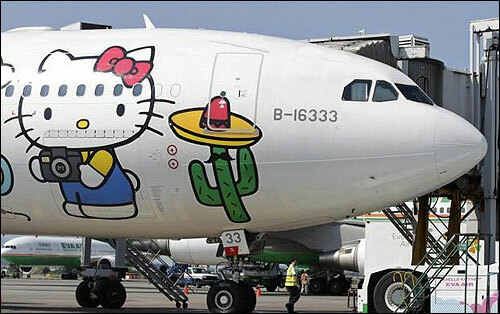 There are currently three Hello Kitty-themed Airbus A330-300 aircraft flying between cities such as Taipei, Fukuoka, Narita, Sapporo, Incheon, Hong Kong and Guam. 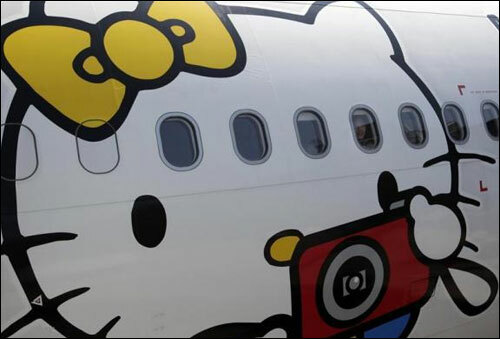 A passenger looks out of an Airbus A330-300 aircraft of Taiwan's Eva Airlines, decorated with Hello Kitty motifs. 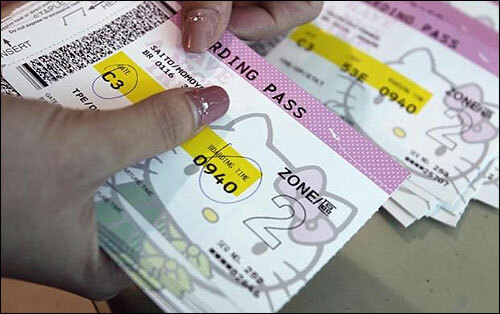 An Eva Airlines ground crew counts Hello Kitty-themed boarding passes. 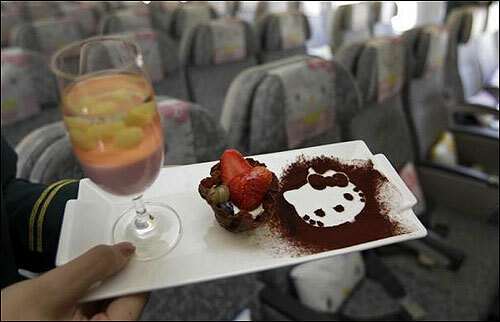 A Hello Kitty-themed in-flight dessert set is displayed. 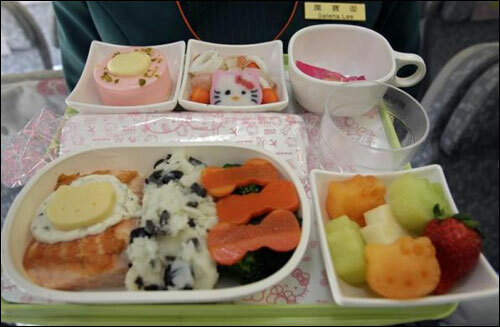 A Hello Kitty-themed in-flight meal is seen inside an Eva Airlines aircraft. 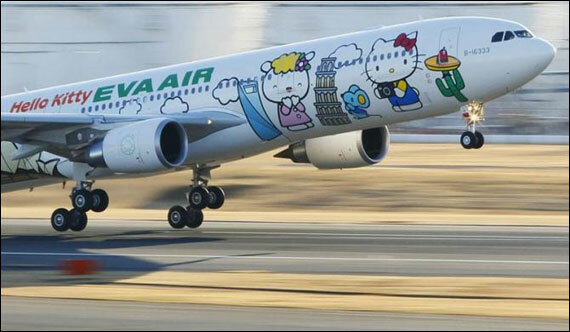 An Airbus A330-300 aircraft of Taiwan's Eva Airlines, decorated with Hello Kitty motifs, takes off from Taoyuan International Airport, northern Taiwan to Sapporo, Japan on April 30, 2012.